There are literally thousands of pieces of flint in the material collected in the 1976-1980 investigations. These range in size from whole cores or pieces of cores and raw material to the smallest micro flakes, and debitage less than 1mm across. So the big question is when is a piece of flint not just a piece of flint? What should be studied and documented more thoroughly? What am I as a lithics expert supposed to look for in order to hopefully gain the most information and insight directly from the masses of similar material? First, we decided to look at the material itself. Flint is not simply flint and there are in fact dozens of varieties of Southern Scandinavian flint which vary in age and source throughout Scandinavia which could potentially show up in the material at Alvastra. Identifying some of these characteristic types of flint could help establish potential trade networks that were in use by Neolithic peoples, including those at Alvastra. We also needed to offer a good digital database including as much practical searchable information on the material for the public as possible. 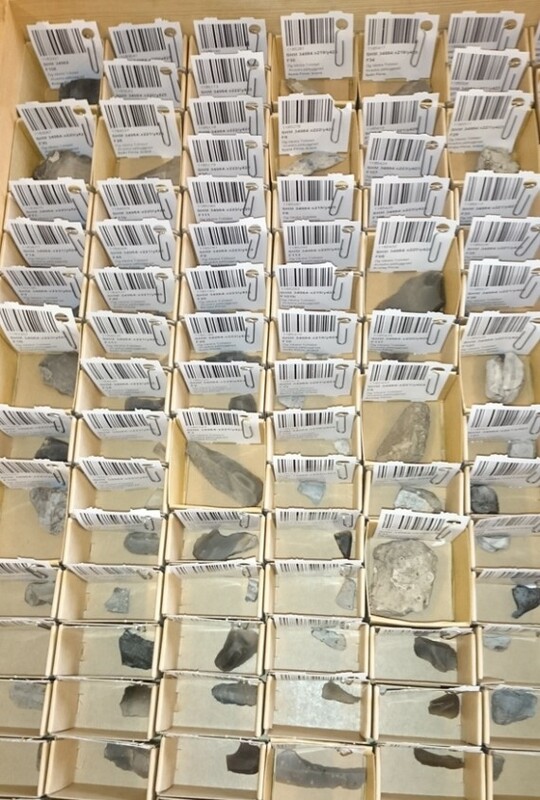 This was achieved by dividing the flint up into traditional groups such as cores, tools, flakes, and blades, as has been standard for the museum utilizing their own on-line digital database, MIS. Much of the material is also highly fragmentary. This could be ritualistic in nature as well as post-depositional. It takes a trained eye to see what something once was, or was in progress of becoming in the chain of manufacture. A good percentage of the flint has also been burnt. This is also possibly ritualistic behavior as it is well documented at other sites with Funnel Beaker cultural components. Even after type, material, and condition have been established it still is only the beginning of the story a humble piece of flint has to tell, as nothing of its context has yet been brought into the picture. But that is a tale for another post. Very interesting to read about how much information there is from just one single piece of flint! Looking forward to follow this project and learn more about the culture in Alvastra.